I am really excited to tell you about the fabulous new happenings at Souvenir! My friend Heather Bullard is the creative genius behind this magazine, and has welcomed me on board as the new market editor! It will now be available online, in an ipad friendly version, and a printable version. 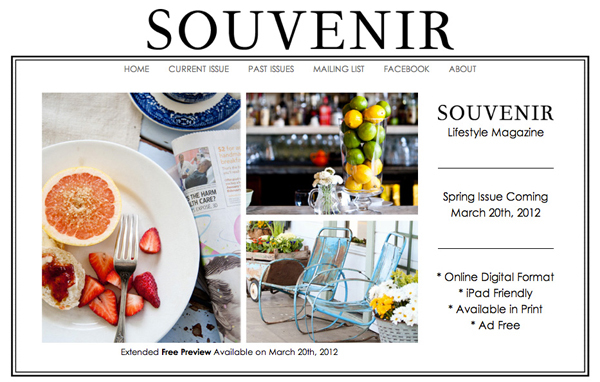 Souvenir is also on facebook, so be sure to check it out! crafts, entertaining ideas, travel stories, as well as lifestyle, and no ads! Heather has a great blog you can find here, if you haven't seen it already! Hope you are having a wonderful romantic Valentine's day. I am off to go make a breakfast buffet for 21 3rd and 4th graders! Congratulations. You will be a great addition to what sounds like an even bigger edition of Souvenir.